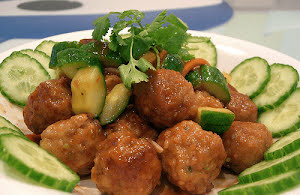 Meatballs drenched in a flavorful sauce base is what you need to satisfy your craving taste buds. The following chicken meatball recipe can be completed in just half an hour. You can use a preferred white meat (firm) variety for these tasty meatballs. I've kept the meatball seasoning light and simple so that its flavor does not overpower the sauce. Leftovers of these meatballs can be stuffed in morning sandwiches. To get the best results, do not over-fry them and take them out when just done. If you're making them for the guests, you can keep the seasoned chicken mince in refrigerated form and can quickly fry them at the right time. Let's make these scrumptious and fulfilling chicken meatballs in a few simple steps. Savor these hot, mouthwatering, and aromatic chicken meatballs which are delicately seasoned with select ingredients and are tossed with sweet and sour sauce. Take a large bowl and add ground chicken breast, ginger & garlic paste, cornflour, dried breadcrumbs, whipped egg, sesame oil, ground black pepper, light soy sauce, and salt in it. Combine everything with your hands and make even-sized meatballs. Meanwhile, combine all the sauce ingredients in a sauce pan. Without putting on a flame, gently stir with a spoon to remove all the lumps. Put the sauce pan on a medium flame and gently stir till the sauce is reduced and gets the right consistency. Remove the sauce from the flame and keep aside. Heat vegetable oil in a heavy-bottomed pan on a medium-high flame. Fry all the meatballs in batches till they turn light brown. In a serving plate, place a handful of meatballs and garnish with cucumber slices in your preferred way. Pour sweet and sour sauce on top. Finish with a garnish of coriander sprigs and serve immediately.